Sometimes painting is just so fun! Sometimes you just go where the paint takes you. This is one of those paintings. It is lively, colorful and beautifully wicked. (Not that you would want to be on that boat.) What is it about square canvases that just gets my creative juices flowing? I love this piece. As a matter of fact, I planned on hanging it in my kitchen but the wall was just too small and the so painting looked cramped. 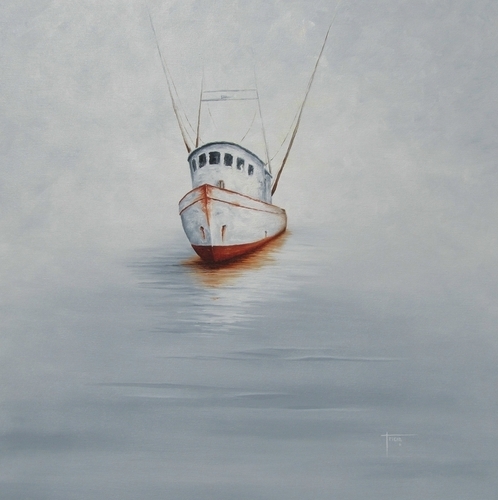 It is comprised of subtle grays and cool blues; very quiet, very calm... And then there is the red-hot, can't miss buoy! Cape Cod along the bike path...enough said! 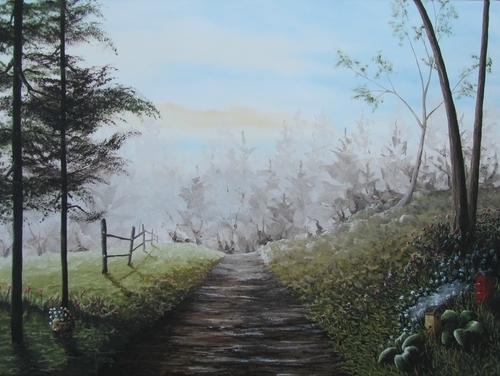 This piece is sunny & bright but mostly it's peaceful & calm. You can feel the breeze through the beach grass. You can hear the calls from the seagulls and smell the salt in the air. Can you hear the waves lapping up on the beach? Can you hear the seagulls in the distance? Maybe you can smell the salt air? Either way, you know what a wonderful, warm treat is just up ahead and around the bend. Relaxation awaits this way... 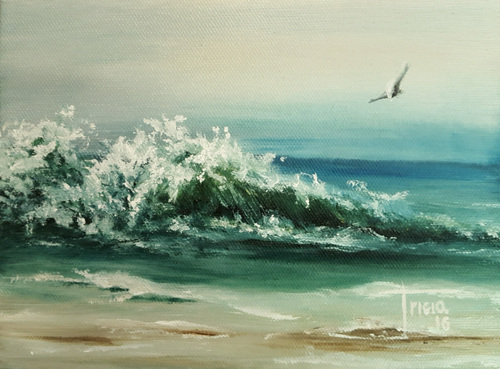 If you would like to see this painting please contact me directly. Such a happy feeling you get when your looking at this painting! 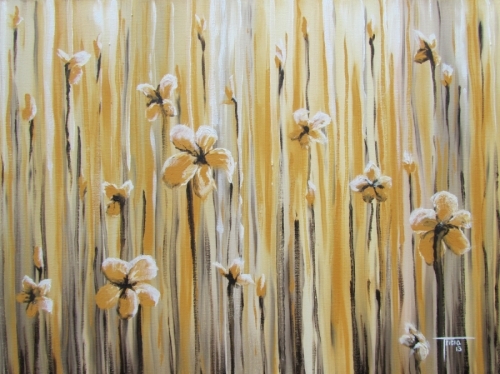 It is a very simple piece; just 3 colors...yellow, brown & white. It is bright, warm and cheerful. You can almost hear the flowers singing 'hello', and see them dancing in the warm sunlight. This piece is a true study in contrasts. The bright sky and snow are gorgeous against the dark trees and brook. The scene is obviously a crisp, cold winter morning, yet the warm sun makes everything feel cozy and hospitable. 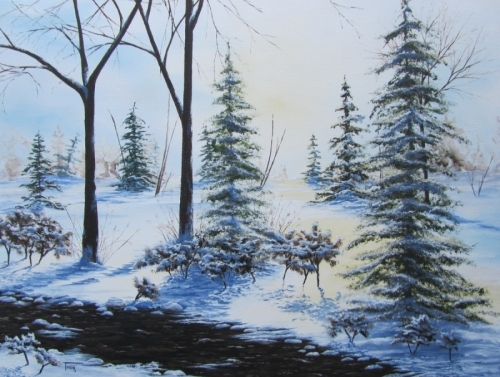 I especially loved creating the shadows that dance across the snow! It's funny how certain areas draw me in. To see this painting please contact me directly. This is functional art! It is art designed to be a candle holder! This is a very colorful piece. It has a large wooden shelf attached by black metal brackets. There are 3 holes in the shelf ment to accommodate glass tea light candle holders. I think this was one of my most successful pieces. I loved how simple it was, yet said so much. The sea was so calm, so peaceful. The boat was a bit battered & bruised. I think it said a lot about the solitude and seclusion of working out at sea. I will miss this painting! It made me very happy when I looked at it. I hope it brings as much happiness to whom ever loved it enough to take it home with them. So fun! Very colorful! This piece is simple, eye catching, exciting. A series of two 16X16 canvases. 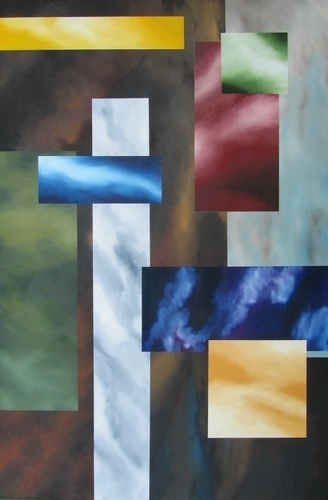 Contact me directly to view this piece. To the best of my knowledge, this is the oldest tree at Fort Phoenix Beach in Fairhaven, MA. It is bent from 150 years of wind blowing from off the water. It seems to reach for Butler Flat...the lighthouse you see out in the distance. 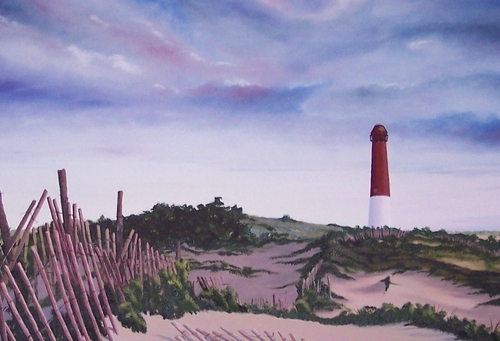 This is a lighthouse in New Jersey that I have actually never been to. I have seen many photos of it & I think it's just gorgeous! The rickety, rambling fence makes me think of my childhood. It reminds me of my parents and sisters on a weekend Cape Cod excursion. I can hear the seagulls, the waves crashing. 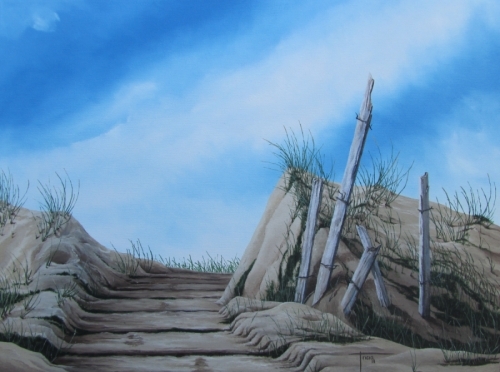 I like that in this painting you feel like you can walk that fence all the way to the lighthouse. I feel like I can meander thru the cool sand forever. 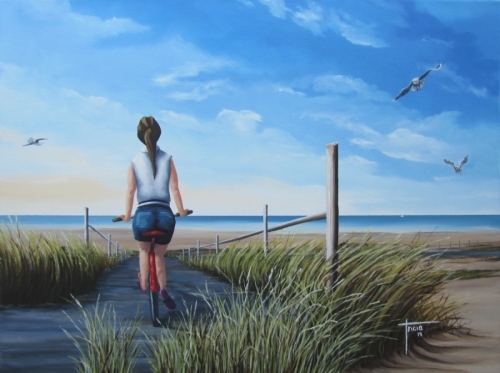 I have never had a piece of artwork sell so fast! 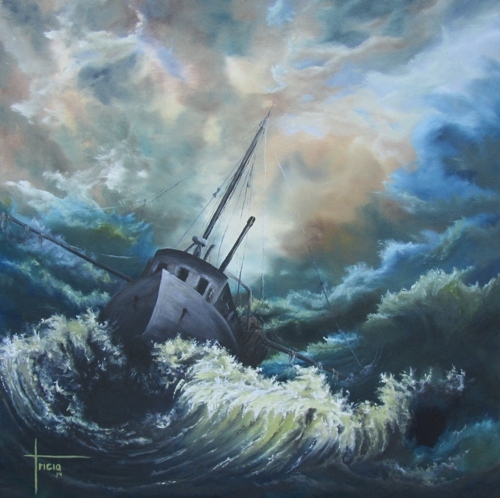 Usually you have paintings hanging for months at a shop before you get the news that one has sold. 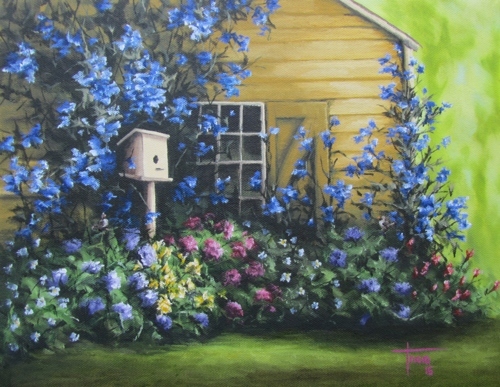 This one hung for a week or two and it was snatched up!. I liked this one. It was fun to paint too, except for all those pebbles. My husband & I were out by Westport, MA shores one very cold, wet day & I got inspired to go home & paint this swirling threatening sky. The lighthouse was added after a suggestion of my brother in-law's. And it worked. I was taken by the sky, but everyone else seemed taken by the pebbles. All those darn pebbles! This is one of my best pieces. I could stand in front of it & look at it for hours! There is something to see in every nook & cranny & you almost expect to see little woodland creatures moving around in there! 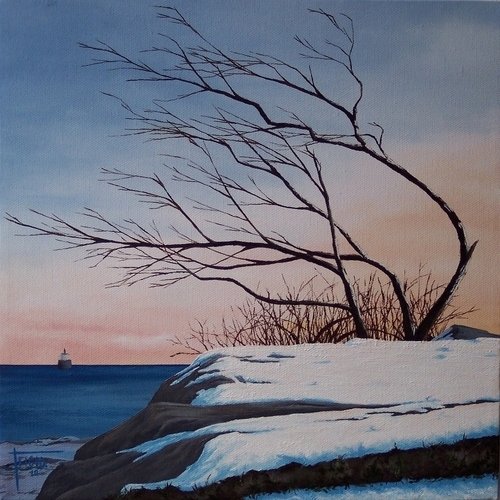 It is done primarily in brown & white, so it is very much about texture & tone. I learned a lot about myself as an artist while painting this. This piece was super fun not just because of the vivid colors, but also because it was able to hang horizontally as well as vertically. I am a big fan of moving art around from room to room & season to season. It helps you to 'see' your older art in a new way. Being able to change the direction of this piece gives it a whole new life! 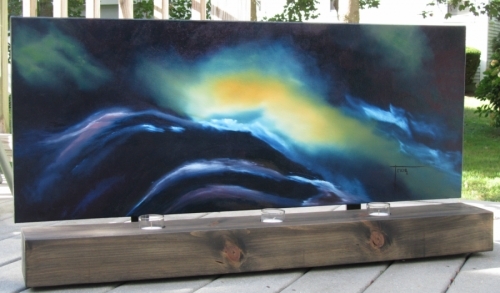 It has 4 12x12 canvas panels mounted on wood. Very simple yet so versatile. This is another one of my husband's favorite pieces. There is a lot going on in the shallow water of the fore front. This painting is all about detail; from the trees across the lake to the tiny stones & reeds under the water. It has a peaceful feel to it. A little boy actually helped me to name this piece. He was looking at it hanging in a local gallery & was asked what he thought of it. He exclaimed "I think it's adrift!" I liked it & it stuck. Contact me directly to see this piece in person. 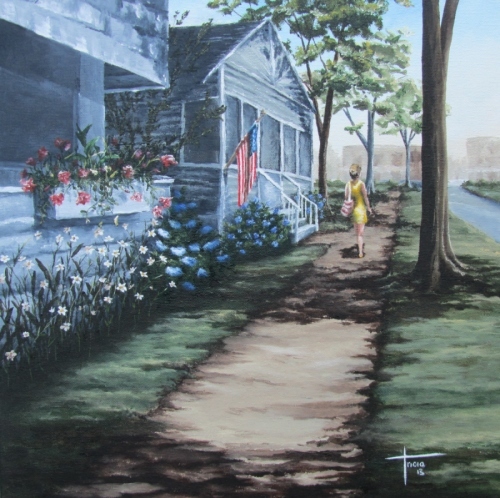 This piece depicts a typical Cape Cod street; tree lined with grey, shingled cottages and blue Hydrangeas. The woman in the yellow dress walks along the dirt sidewalk between the puddles of sunlight & shade. 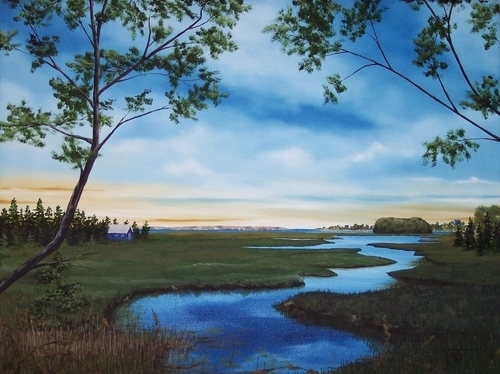 The painting has the feeling of a true hazy, lazy summer day on the Cape! To see this painting please contact me directly. My husband & I like to ride our bikes in the summer time. We are lucky in Fairhaven to have a bike path that stretches thru the town. This is the view of the bay area. I usually have to stop for a moment or two when I pass by just to take it in. It's too beautiful and peaceful to just pass by. Once in a while a swan couple will take up residence here for the season. To see this piece in person contact me. 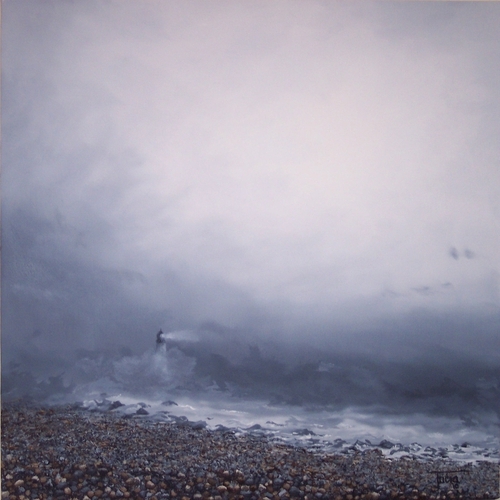 I painted this one a couple of years ago now, but I am always amazed at the response it gets from people. Many people are really drawn to it. I think maybe it's due to the very calm, quiet feel of the painting. It is serene, relaxed, undisturbed. I guess we could all use more of that in our lives. Series of 3 8X10 Canvas Boards. 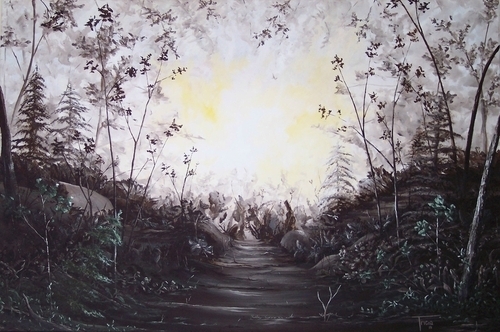 Contact me directly to see this painting. This is the view of New Bedford, MA from the hurricane barrier in Fairhaven. My husband and I always walk or ride our bikes on the barrier and take in the views. This is a very simple piece. 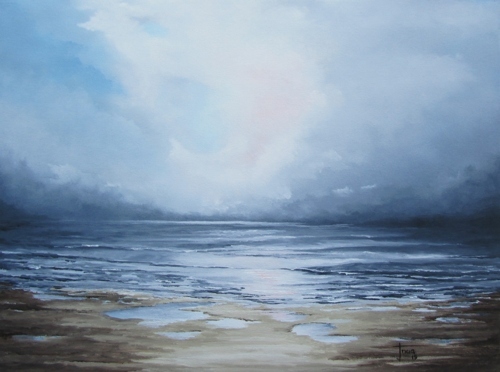 I enjoyed painting this sky with it's sweeping clouds. I do get lost in skys! To see this piece contact me directly. 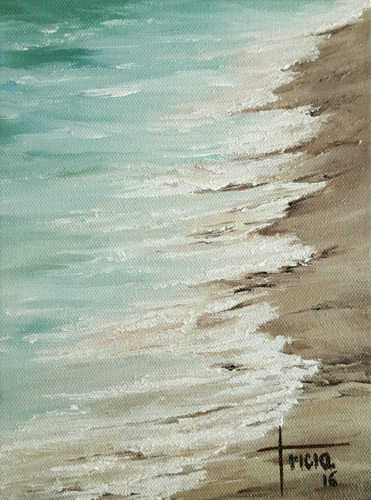 This petite painting is part of my beach cottage series. It is a simple reminder of the easy Cape Cod summer life. Webster's New World Dictionary defines 'Soar' as to rise above the usual level. I like that. This is one of my tiny 'beach cottage' treasures. This makes me think of a Cape Cod cottage. The perfect place for a 'staycation'. Can you hear the birds singing? I simply must walk on this shore! It seems untouched, unspoiled. Total relaxation.